This is the complete, ultimate creative experience! 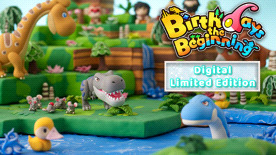 The Digital Limited Edition of Birthdays the Beginning comes with the game, the digital soundtrack as well as the digital artbook! Cultivate a gorgeous, intricate world teeming with life and learn all about the critters you will encounter in the art book while listening to the beautiful music that comes in the soundtrack. The sky's the limit in Birthdays the Beginning! A World All Your Own - Create any world you can imagine! From staggering mountains and sprawling forests to a deep sea dotted with islands, there's no limit to your creations. Life from the Beginning - Discover the history of everything as you foster life of all shapes and sizes - from single-celled organisms to complex multicellular life, including plants, mammals, dinosaurs, and more!